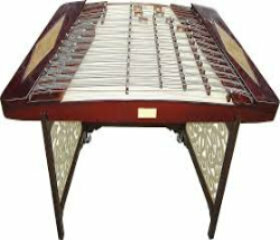 The trapezoidal Yangqin ( 扬琴) is a Chinese hammered dulcimer, originally from Persia (modern-day Iran). The yangqin was traditionally fitted with bronze strings (though older Chinese stringed instruments used silk strings, resulting in their, and the yangqin’s, categorisation as a silk, or “si” instrument), which gave the instrument a soft timbre. This form of instrument is still occasionally heard today in the “hudie qin” (蝴蝶琴, lit. “butterfly zither”) played in the traditional silk and bamboo genre from the Shanghai region known as Jiangnan sizhu (江南絲竹), as well as in some Cantonese music groups. Here is the list of Yangqin ( 扬琴) MP3 in our media library.